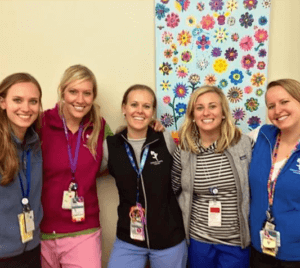 Meet Lauren Renfro, RN, a Core Charge nurse in the CCBD unit (pictured center) at Children’s Hospital Colorado (Aurora). ATI Nursing Education interviewed Lauren about the ins and outs of the CCBD unit. I work at Children’s Hospital Colorado as a Core Charge nurse. The hospital unit I work on is the CCBD (Center for Cancer and Blood Disorders) or, as most know it, the pediatric cancer unit. I have been a nurse on this unit for over 3 years now and love it! When I was a new graduate nurse, I worked at KU Med Hospital with adult cancer and bone marrow transplant patients. I always knew I wanted to work with children and therefore, when we made the move to Colorado, I made the move to pediatric nursing. As a Core Charge nurse, I round with the doctors on all the patients, prepare assignments for the next shift, and help make sure the unit runs smoothly during the day. The CCBD is made up of children with cancer, hematology disorders, autoimmune disorders, and children receiving a bone marrow transplant. What inspired you to become a CCBD nurse? My grandpa passed away from Leukemia when I was in 5th grade. Even when he was so sick, he always bragged about the nurses and the care he received while he was in the hospital. He inspired me to want to care for others and therefore, I decided to pursue a career in nursing. I have always loved children and babysat since I was in middle school. I knew I wanted a career working with kids. Right after nursing school, I got a job in adult oncology and after 2.5 years of caring for adults, I pursued my dream job in pediatric oncology. What are your main roles as a CCBD nurse? As a CCBD nurse, our main role is to provide the best care possible to our brave little cancer fighters, hematology disorders, and bone marrow transplant kids. We provide support to families upon new diagnosis of cancer, provide education about treatments, support children and families through bone marrow transplant and provide a positive outlook for their future. Our unit has many immunocompromised children and therefore, we provide a safe environment for them to thrive in. What is the most difficult role that you hold? The most difficult role is maintaining resiliency as a nurse. Although most children can be cured of their disease, there are many hardships they face along the way. We have happy days and we have sad days and all the nurses in the CCBD care so much about our patients. It can be hard to want to go work knowing that these kids and their families are suffering from their treatments. There is nothing worse than seeing the look on a parents face after being told their child has cancer. However, the nurses and staff in the CCBD have some of the biggest, warmest hearts in the world and we help families through the battle. How did you prepare to take on this role? I prepare to take on this role by keeping a positive attitude and outlook on life. These kids are the biggest superheroes I know and they help make my job so rewarding. The CCBD is full of amazing staff and we all lean on each other for support. What is the most exciting role that you hold? I actually have two exciting roles in the CCBD. One of them is being a part of the leadership team. I have been a nurse for almost six years and remember what it was like to be a new graduate nurse. I enjoy being a mentor to the new nurses on the unit and watching them learn and grow into amazing nurses. The second most exciting role is being the nurse who gets to discharge a patient after they have spent weeks to months in the hospital going through a bone marrow transplant or chemotherapy treatment. We make it a very special day for these kids by decorating a personal cake and getting the whole unit together to sing for them as they leave the unit. Each child who finishes treatment or leaves after a bone marrow transplant gets to ring a loud, giant bell before they are discharged. It never fails, I tear up every time! What advice would you share with nursing students interested in becoming a CCBD nurse? I might be biased, but being a CCBD nurse is one of the most rewarding nursing careers. I get to hang out with some of the coolest, bravest kids and their families’ every day. I love my job and my coworkers and look forward to the challenges each day brings. My advice is to always follow your goals and pursue a career that makes you happy. Becoming a nurse has so many advantages and the career options are endless. Do not settle until you find a position in nursing that truly makes you happy! Looking to learn more about the day-to-day of being a nurse? Be sure to like ATI Nursing Education on Facebook for updates and articles just like this.